They told us it couldn't be done. Sentinels challenge everything you know about high-end playing cards. You have never seen a deck like this before. theory11 has set the bar high month after month, pushing the envelope with each playing card release from Guardians to Monarchs to Steampunks. We don't rest. It started with an idea born 30,000 feet in the air. On a flight back to New York City from Magic-Con, theory11 CEO Jonathan Bayme made a quick sketch on his iPhone. Less than 24 hours later, the concept was sent to Hatch, an industry leading design firm in San Francisco, California that produces illustrations for Coca-Cola, Pepsi, Starbucks, and Target. Over the months that followed, we refined the concept with illustrations prepared specifically for the deck after hundreds of pages of research on the history of magic, hermeticism, secret societies, and mythology. The result is jaw dropping - unlike anything you have ever seen before. The box is printed on imported paper 40% thicker than normal tuck cases - and has metallic accents on SIX sides. The art is embossed in 20 locations and coated with a matte varnish to enhance durability. Clean, elegant, and refined design. The first mainstream deck in magic that is composed 100% of original art - the faces, the backs, the box. And yes - even the court cards. Every single design element has a meaning behind it. The deck represents magic, the industry of deception, and the allied arts. 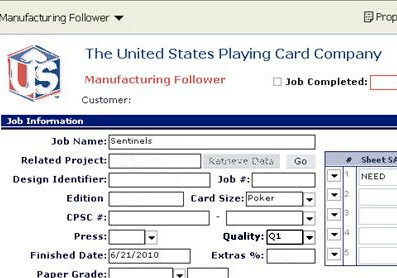 Printed exclusively in Q1 quality on the casino web press at the United States Playing Card Company, under strict supervision from senior press technicians.They've been called "the world's finest deck of cards." This new edition features an improved 909 Premium Finish, with the same critically-acclaimed design of the original printing. Sentinels are in stock now for immediate shipping.